I totally understand and am for the whole concept of thematic decorating. It makes all the difference between a party/celebration and a regular get together dinner. I can totally see why Easter egg and Easter bunny shaped chocolates are selling like hot cakes around this time. I can even see why people would buy plastic green grass table mats and decorative Easter bunny’s for that extra thematic touch (plus you can always use it again next year!). 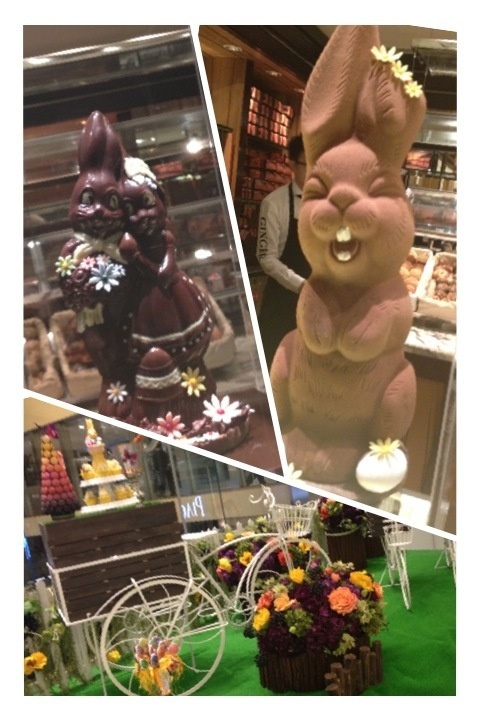 What I am curious about is who would buy those giant chocolate Easter bunnys, like the ones they’re selling for $800HKD (~US$100) at the Mandarin Oriental cake shop. They look absolutely gorgeous and delicious, but they won’t exactly last until next year in your cupboard if you know what I mean. Towards the end of the party, do people pretend it is a pinata, and smash it to pieces so that everyone gets a bite? Or do they melt it and make double chocolate cookies for the next party? Now that is a neat idea!